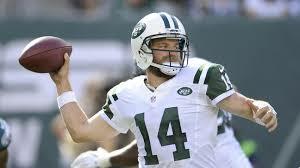 Can Ryan Fitzpatrick lead the Jets to the playoffs the way former Jet Chad Pennington took Miami in 2008? Nearly seven years ago to the day, the New York Jets had Brett Favre at quarterback, near the end of his storied career but also near the end of a one-and-done divorce with Gang Green. In the 2008 season finale, the Jets had been eliminated from the playoffs, but were hosting a Miami Dolphins team with a chance to — gasp! — win the AFC East. And, wouldn’t you know, they had an old friend of the Jets under center in Chad Pennington. In 2008, Chad Pennington beat his old team in Week 17 to earn a playoff berth. Can Ryan Fitzpatrick do the same on Sunday? The former Jets first-round pick was having a resurrection after a disastrous end to his eight-year New York tenure in 2007, having been signed by Miami late in the summer of 2008. In a rare year in which the AFC East was a wide-open race (because Tom Brady tore his ACL in Week 1), the Dolphins made a furious push after a 2-4 start to get to 10-5. Pennington had started every game that season for a franchise coming off a 1-15 debacle of a season. Stop me if this sounds familiar. It should, because it’s an eerily similar scenario for the Jets this year as they travel to Buffalo in Week 17 with a playoff berth on the line. New York is led by Ryan Fitzpatrick, only anointed the starter after one ill-fated punch to the jaw of Geno Smith by I.K. Enemkpali (who now plays for the Bills, Sunday’s opponent). Like Pennington, Fitzpatrick will be returning “home,” although to be fair, he has four other places he used to call home, too. He will face former Jets head coach Rex Ryan, who is looking to stick it to his old team. The problem is that in doing that, he might let an AFC powerhouse sneak into the dance. If the Jets win, the Pittsburgh Steelers are eliminated (let’s assume that a snowball has a better chance of surviving in hell than the Browns beating a ticked-off Steelers team). But a Jets loss opens the door to a very dangerous team. It was a similar scenario in 2008, when the New England Patriots (albeit led by Matt Cassel) would have been next in line had the Dolphins lost. But they didn’t, as Pennington went 22-30 for 200 yards and two touchdowns in a 24-17 Miami win. The improbable playoff berth was made even more remarkable by the fact that Miami started 2-4, and won its final five games after being smacked down by the Patriots in late November. Similarly, the Jets appeared to be fading after a 24-17 loss to Houston in late November before stringing together five wins. Fitzpatrick is not only a Comeback Player of the Year candidate (an award Pennington earned in 2008), he is also a legitimate MVP contender. The Jets were 4-12 a year ago, costing Ryan his job, and then came the embarrassment of the Smith incident before the 2015 season even began. In that 2008 Dolphins-Jets tussle, one would have to wonder if the notoriously-salty Jets fans were actually rooting against their team considering they had been eliminated and a win over Miami would open the door for the hated Patriots. It may be similar for Bills fans Sunday, who may rather see the Jets get in than the Steelers, who have won three AFC championships in the past decade. One person whose team was victimized by that 2008 Fins-Jets matchup has already proven that he is rooting for the Jets. That would be none other than Bill Belichick, whose questionable decision to kick off to start overtime last week raised eyebrows as to whether he may have “tanked” the game to keep a dangerous Pittsburgh team out of the playoffs. A Jets win Sunday would grant Belichick, a former Jets coach, his wish. Fitzpatrick doesn’t need any extra incentive to win Sunday against the Bills, who New York actually lost to earlier this season, 22-17. That didn’t deter the Dolphins back in ’08, as they had lost to the Jets at home in their season opener, 20-14. Whatever happens on Sunday, all eyes will likely be on Orchard Park around 4 p.m. That includes the Steelers, as their game with lowly Cleveland will likely be so well in hand they can afford to take their eyes off the road for a little while. The Jets aren’t gunning for the division crown as the Dolphins were in 2008, but they are pushing for a playoff berth, and their path to this point looks eerily similar to that Pennington-led Miami team of 2008. Be the first to comment on "Jets’ Finale Scenario Conjures up Memories of an Old Friend"